Once again, I'm happy to be part of a book tour for Bloomsbury. 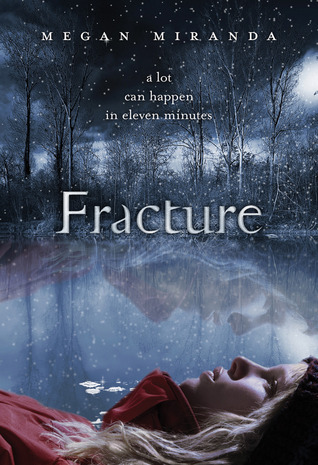 Today, I share my glowing review of Fracture by Megan Miranda. I scored this reader at ALA. My copy is plain baby blue with no picture so I had no clue what this story was about (I don't read book summaries). Luckily, I had started to hear some great things and took a stab at it myself - glad I did! Take a look at this awesome cover! I suppose Delaney's rescue from a frozen lake can be called a miracle. She's alive, but for all intents and purposes, she shouldn't be. After waking up from a 6-day coma, Delaney seems to have no lasting effects from that awful day. Well, there is just one. A nagging pull or tug to people she doesn't know, people who are are on the edge of death. How is this possible and why is she drawn to the dying? Delay meets Troy who comes off a little strong and soon, we know he has an agenda. This guy gave me the chills. I couldn't quite pinpoint what I didn't like about him, but I knew something was off. He has an air of suspicion and when he enters scenes my pulse raised. I thought he could either be a mass murder or just a seriously mentally kid. He had me guessing for a long time. Delaney's best friend Decker, the boy who saved her from drowning, is a different story. He is the kind of guy you can take home to mom and dad for Thanksgiving. All American, sweet, compassionate, and true; Decker is exactly what anyone would like in a boyfriend. You would think that Delaney would know that too. Nope! I was hanging off the edge of my seat waiting for Decker to make a move on that girl. He has so many opportunities and it was struggle to watch him walk away over and over again. Is that not teen love, though? Putting your toe in the water just a bit to test the temperature. That is exactly what Delaney and Decker do. I'm pretty sure every young adult has done that at least once in their life. Delaney finds herself in some crazy messed up situations because of "the pull." Those scenes were riveting! I would get this uh-oh feeling when I knew something in Delaney was stirring and I just couldn't put this book down. It's amazing how well we get to know Delaney and see her transform into someone else in less than 300 pages. I wish I could say exactly what that something else is, but I can't put a word to it. I'll let you decide for yourself when you read it. This book is spellbinding, mesmerizing, and absolutely irresistible with a paranomal*ish feel. I. Need. More. Check out Fracture on Facebook for exclusive content and tour information!